People gather in San Jose to raise awareness about the Dakota Access Pipeline and raise funds for protesters (Nov. 12, 2016). 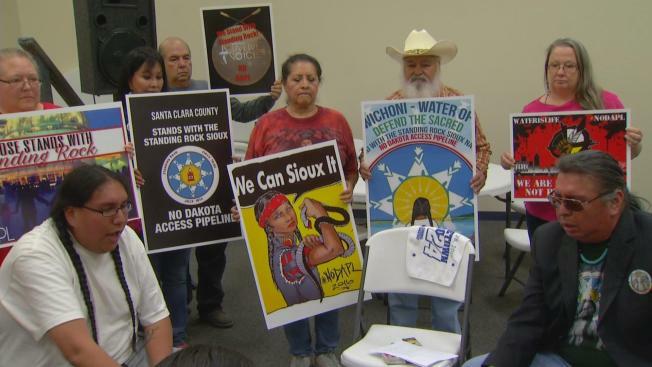 Community members gathered in the South Bay Saturday to portion supplies and raise funds for the protesters taking a stand against a controversial pipeline being built in the Midwest. The Dakota Access Pipeline, upon completion, is slated to funnel oil from North Dakota to Illinois, but the Standing Rock Sioux tribe and other opponents have decried the construction on the grounds that the pipeline could harm clean drinking supplies and desecrate sacred burial grounds. William LeBeau, a member of the Cheyenne River Sioux tribe who was on hand at the San Jose-based fundraiser, wants those folks in North Dakota to know that people in the Bay Area are thinking about them and doing everything in their power to assist in the protest movement. "We're actually coming together as one tribe to unite, stand in solidarity with the Standing Rock people and for those water defenders and protectors," he said. Organizers in the South Bay say that they plan to drive the supplies, which include tents and blankets, along with donations to North Dakota for distribution.